Works by the high temperature and humidity of the air compressor, the first heat exchanger, and the low temperature dried air for heat exchange, lowering the temperature, and then is further cooled to the evaporator, most of the gaseous water molecules in the evaporator condensed into liquid water is discharged. Thereafter a low moisture content is further compressed air into the cylinder adsorption dehumidification drying, to obtain a lower dew point of the product gas, and finally cold dry compressed air enters the heat exchanger, cooling the inlet air temperature and humidity, and temperature rise itself high, preventing the outer pipe of the conveying condensation, warmed dry compressed air is used as a small part of the regeneration of the adsorbent, improve regeneration efficiency, reduce energy consumption. Compressed air dryers commonly used in the main refrigeration compressed air dryer and adsorption dryer of two types, cold and dry machines where the presence or absence of gas consumption, the advantages of low energy consumption, but there are limitations dew point temperature, and although the dryers have the advantage of a low dew point, there is regeneration gas loss, high energy shortcomings. 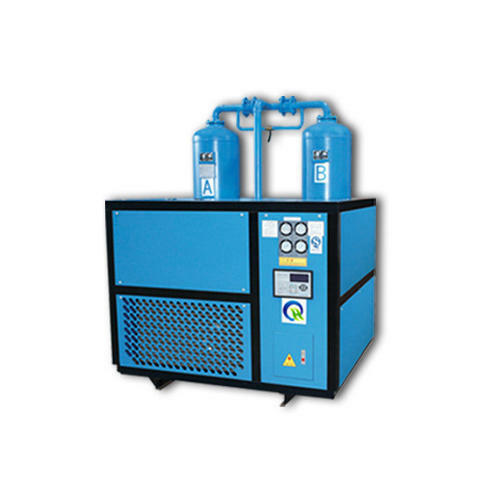 Our company developed a low dew point modular compressed air dryer is to combine the respective advantages of cold and dry machines and dryers, the connectivity and capacity with a reasonable pipeline, to maximize the advantages of both, to achieve the best economic operating point and high-quality product gas high dew point. The year was 2014 when we Enginox Technologies [Ahmedabad] were starting and then onwards are successfully operating the heavy business of Manufacturing, Importing, Exporting and Service Providing a wide assortment of Plant and Machinery. For our valued customers, we have introduced PSA Nitrogen Gas Plants, VPSA Oxygen Plant, Air Dryer, Biogas Purification Plant, Carbon Molecular Sieves, Activated Alumina, Gas Generation Plant AMC Service and many more. Offered range is made using only high-quality components. These products are admired by the clients for their features like easy installation, light weight, long life and maintenance free nature. Offered products found their usage for various fields such as Modified Atmospheric Packaging of juice, milk, water, coffee, Olive Oil, Storage and Production, Milling and Cold Storage of fresh vegetables. Moreover, we are also offering maintenance Service to our valued clients. We export our products in UAE, Jordan, Malesiya, Iran, Egypt, and Russia. The complete designing process is done in our infrastructure, established over a large area of land. As committed to catering our valued clients' expectations, we strictly follow the industry laid norms and, thereby, provided product array offered with perfect designing and assured quality. Owing to our optimum grade products range, we have developed a huge client in the market.